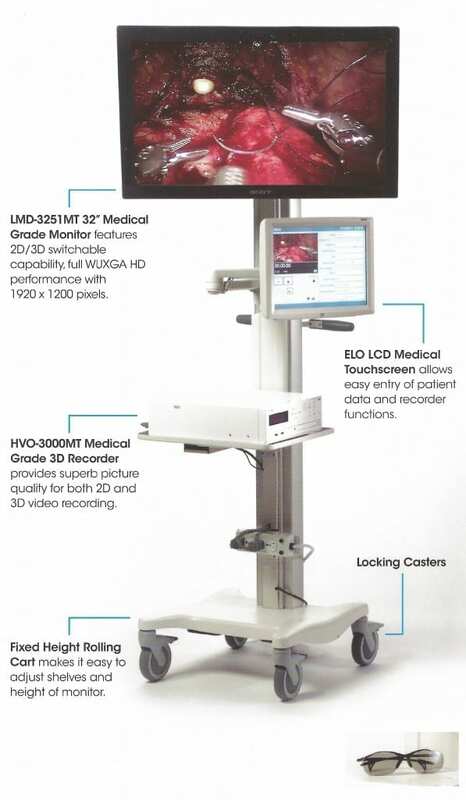 3D video system microscope integration can be a daunting challenge not only in the integration to the microscope but also with operation by the operating room staff. Sony makes this process seamless. The Sony HD cameras are mounted on any 1/2″ c-mount video adapter, bilaterally. The Sony MCC3000MT camera control unit is two-in-one and as a result both cameras plug into one CCU there eliminating gen-locking two separate CCUs. The HVO3300MT HD 3D 2D recorder can accept recordings from any camera system. In addition, each surgeon recording preferences can be individually programmed. Further more, the monitor is the Sony 55″ medical grade 3D HD monitor. As a result all these components can be mounted on the Sony MSC/11 monitor cart making it very mobile in the operating suites.